As you know, the topic of halloween costumes has been flying around the townhouse lately. I'm not scared to admit that I am indeed, scared. 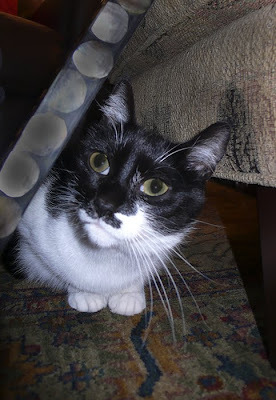 Like any feline worth their weight in catnip, I am extremely curious and sneaky. So I checked the history of Glogirly's internet browsing. Are you impressed I know how to do that? She's even tried to throw me off by using both Safari AND Firefox. It appears as though she's been collecting costume ideas. And I'm not talking about ideas for her and Gloman. You got it, these ideas are obviously for me. I'm continuing to watch my back. But this afternoon she tricked me by luring me into the daily bed-making ritual. Dirty pool if you ask me. Once I was lost in my nirvana of twirling under the covers, she produced this ridiculous looking dinosaur helmet thing. It had purple spikes and a velcro chin strap. I was not pleased. She forced it on, overpowering me with her brute strength and immense size. Then she started taking pictures. Humiliating I tell you. I wasn't about to let her get anything as good as yesterday's Cosmo cover shot. I was finally able to rip the helmet from my violated head and take it down. Down the stairs that is. Later I tried to show Glogirly that perhaps Red Dog could be a dinosaur. Stupid dog's head was too big. I've since hidden the dinosaur helmet and I've got her thinking twice about ever putting anything on my delicate head again. Glogirly, I'm STILL watching you. Oh no! Costume time again!!! We are sad to say we have costume #4 and #5, we wore them last year. The mom said because of the economy, we will probably be reusing our costumes from last year. We are very impressed that you know how to look at the computer's browing history. You are not only beautiful, but very smart! MOL!!! Katie, you sure do make us giggle! And, we finks you looks adorable in the dino helmet! Even if GloGirly violated your head!!! We think the fairy costume is cute though!!! Good luck and have a GRRR-8 weekend! MOL! It looked furry cute while it lasted, but I know how you feeled. If Mom tries to put sumfin on my head, it must be bited an killed. Efun if she takes my collar off, I gotta bite an killify it. Keep an eye on dem beans! Hey I like the jester costume Katie and you really should give it a try. You are good at entertaining the two who live with you. Plus the colors would look good on you. Have a great weekend. Haha! 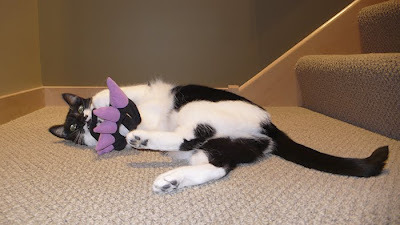 We think that dinosaur thingey makes a better toy than a costume! Last year our mom went out and bought us some costumes to wear...needless to say, we did not cooperate and she was forced to return those nasty costumes from whence they came! The only costumes we will wear are those that can be photoshopped on! I think the dinosaur hat is cute! We almost got the jester hat/collar for Harley this year, but went with something else instead. I love Halloween! I am glad to see you put the claws of dood to that thing! 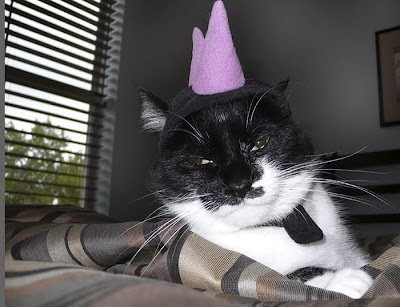 Katie, I really thought you of all the kitties would not be forced to wear a costume. 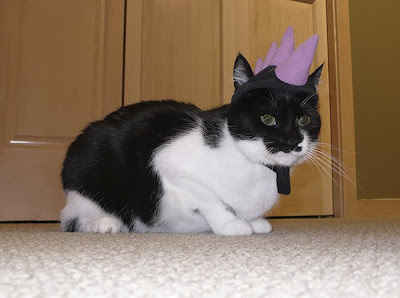 I have to admit, though, you look so cute as a dinasaur. 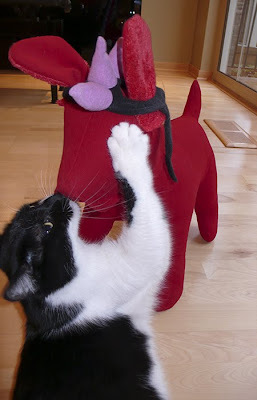 You also look cute trying to get it on Red Dog's head. Keep an eye on Glogirly! We still have two weeks to watch our backs. Hi, Katie. Tank u fir cominz & sees me atz my bloggie tingie. OK? I dunt wearz not cos-tumiez & my hoomin bean knowz dat! OK? I wentz to my kitty-kat dok-to todayz & I getz 2 nassy shotz! And dey trimmeded my clawz beforez dey gibz me dem shottiez! OK? I dunt likez dem nassy shotz! Notz atz allz atz allz. OK? I don't do costumes. Mum tied a ribbon around my neck once and I shredded it. She learned her lesson after that. That's my best dinosaur growl. OOPS not furry gud is it? Your costume is much better than my growl. YOU looked adorable, but hey I second your feelings. Mom put something on my head once and I ripped it off and tore it up in nanoseconds. It was the last time she tried that. So she has to use some photoshopping to put me in a costume. I never thought I would thank Cod for Mom's nickname... "Her Cheapness"
My Mom put antlers on me for Christmas last year...that was enough for me! 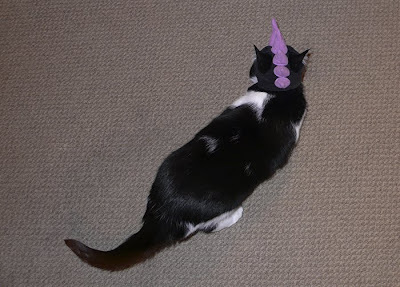 How humiliating!I'm hoping that she forgets about Halloween, so are my feline sisters. The color purple is so you! The dino helmet looked cute on you, Katie, but I sympathize with you about not wanting anything on your head but your ears. 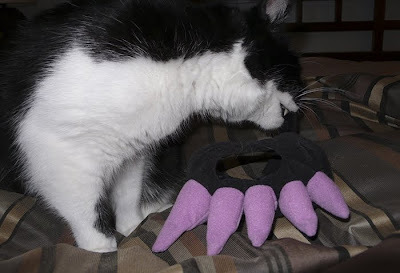 Yup my mum better not chase me with a costume, I'm sharpening my claws already. ummm, your mewmie asked our mewmie where she could get a wig like Nani is wearing (Disco did wear it once, too). She went overboard and got ours at KittyWigs.com but you can go into a craft store and buy 10 wigs for what she paid for that pink number. Here's a link to some great "doll' wigs! Oh, you look totally hissed off about that Katie...but we kind of liked how you looked in your costume. We can hardly wait to see what you'll be wearing for Halloween! 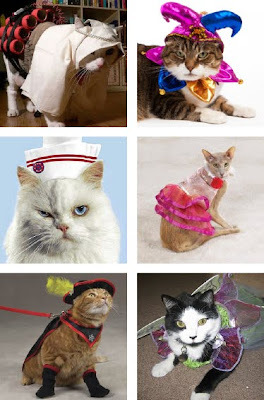 We thought you might like to see what us Furrydance cats have to put up with when it comes to costumes. Our mewmie tells everyone her very first screen name was Katznhatz, so you have some idea of how long this obsession has been going on! She seeks out costumes everywhere, but mostly finds dog stuff at Petco and PetSmart. Dog clothes aren't really cut for a cat figure and are often way too big around the neck part, but she has been at it so long, she knows what styles fit. You may want to check out our "Cat Walk" Fashion Show, as forewarned is forearmed! Hi Katie, nice ta meet you. Thanks for stopping by my bloggie. I really like your dino helmet. And when I say I really like it, I mean.... I REALLY LIKE IT!